There is NEVER enough time in the day. Deadlines loom, interruptions are constant and your to-do list seems to grow, not shrink. Such are the joys of most workplaces in 2018/2019. So here are three simple (free) things you can do to win back 15 minutes each day. (actually mileage may vary – I actually think its closer to an hour a day). 1. Turn off Outlook distractions. For many of us, inbound email demands immediate attention. The mail alert pops up, then it persists on the screen, nagging us to wonder if the matter is urgent. We wonder if we’re going to miss an opportunity, or be able to head off a problem, if we check the message. So we stop whatever we were doing to check the message. We’re now distracted, we’re dealing with something that wasn’t what we needed to get done, and the urgent is suddenly taking precedent over the important. For some roles, and at some times, this is important, but for most of us we simply need to stay focussed on the task at hand. The secret therefore is to STOP letting email steal our attention. The answer is to turn off notifications and to only check email 3-4 times a day when it suits us. 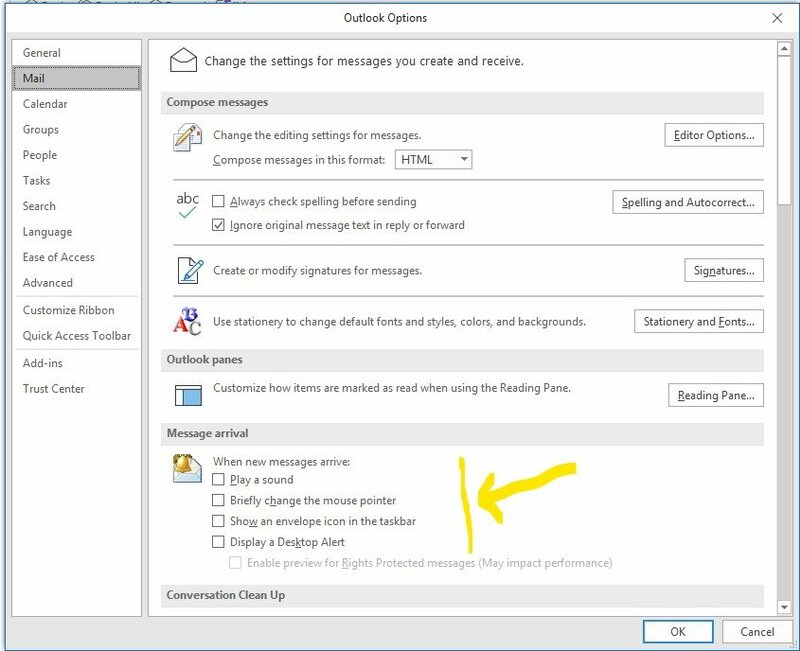 In Outlook, open File-Options and then pick ‘Mail’. Then scroll down for the ‘Message Arrivals’ section and turn the notifications off. 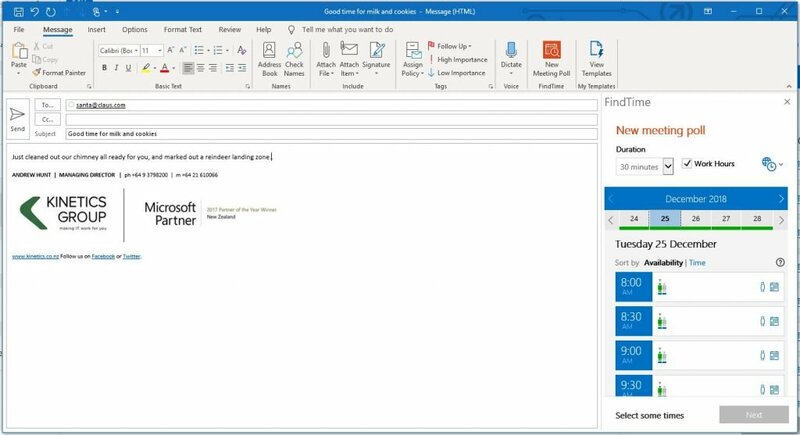 The alternative is to put Outlook into Offline mode for periods of time – that’s an option on the ‘Send / Receive’ task bar. This one may seem familiar, as we’ve highlighted it before, but it’s such a winner that we thought we’d mention it again. Findtime is an Outlook plug in that lets you invite meeting participants to vote on a time that suits them and find the one in common. No more long email threads asking if Monday at 2pm is good, or Wednesday at 10am, and then repeating until you finally get one that fits. Findtime does all of that, and it reserves the unconfirmed times so you don’t double-book. When a suitable time is agreed, Findtime automatically confirms it in your calendar and removes the unused time slots. Once it has loaded, Findtime will appear in your Outlook taskbar. When you use it, it opens a pane on the side of Outlook and its fairly straightforward from there. 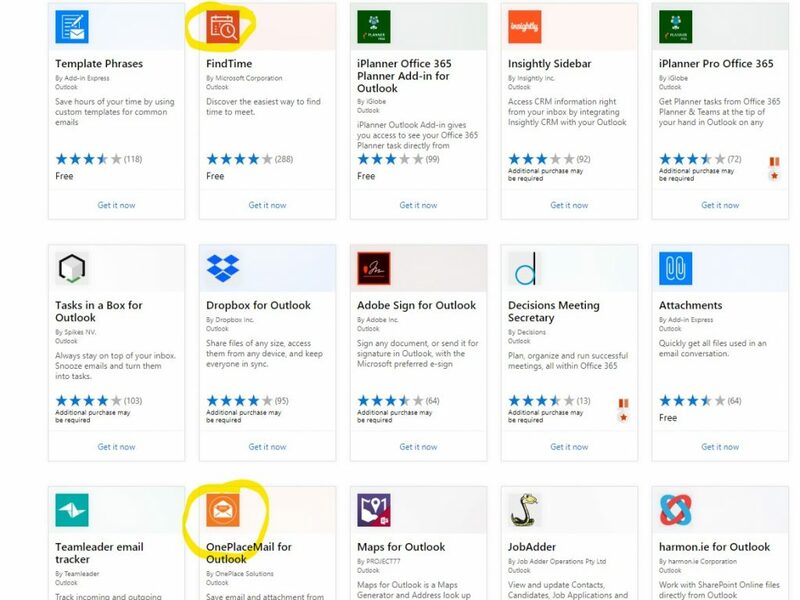 Tip – if it doesn’t open, check ‘findtime.microsoft.com’ is a ‘trusted sites’ – I use an HP laptop with SureClick to help keep me safe, and this was blocking the add-in – you may have similar tools that need configuring. 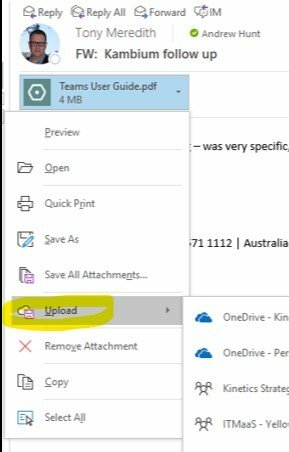 Some readers may point out there is an upload feature in Outlook already, but this of course only saves to OneDrive and Outlook groups – we like OnePlace because it lets you save to all your 365 locations. For more great time saving tips, we recommend booking one of our Kambium consultants to visit your workplace to help you find some simple tips to help you work smarter. 3 things to look forward to when you go back to work in 2019! Don’t be fooled! FAKE problems.